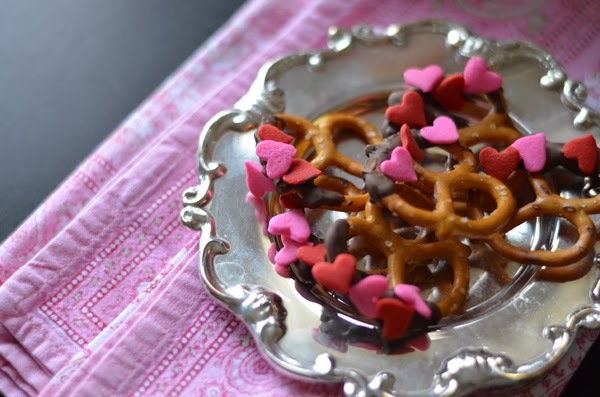 Valentine's is a good excuse to bake some yummy treats. And since I have a wonderful and energetic little helper cooking and concocting are even more enjoyable. 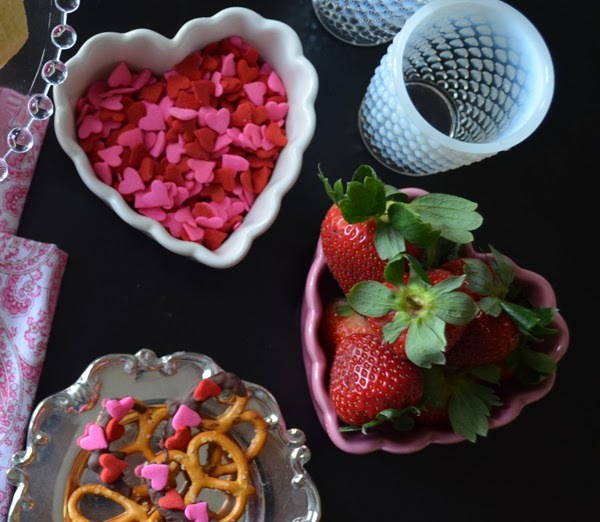 We bought these cute heart sprinkles at the supermarket which were just waiting for us to infuse some Valentine spirit into some otherwise traditional fare. So, we came up with adding chocolate and sprinkles to madeleines and pretzels. It was easy and fun and the end result was particularly pleasing to the eyes. I mean add hearts and chocolate to anything you have yourself a party. We used this Madeleine recipe here. 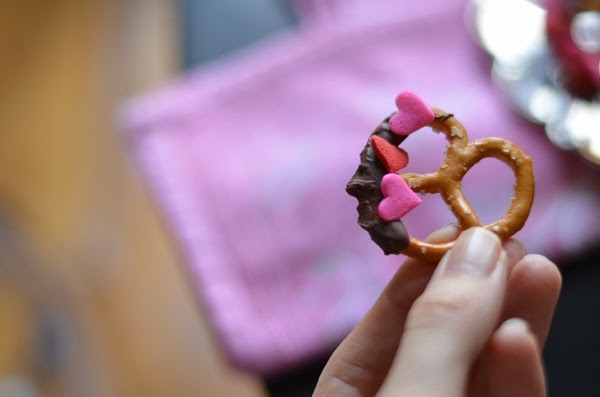 And then we melted some dark chocolate in the microwave and dipped the madeleines and pretzels inside and the sprinkled on the hearts. Easy and festive. William Sonoma no longer has my heart ramekins but they have other wonderful heart shaped pans and cookie cutters to set your imagination on fire. oh my goodness so incredibly cute! and they look absolutely delicious. am i allowed to have a madeleine for breakfast? I watch my niece on occasion and am always looking for fun little projects for when she comes over - this is just adorable! oh my dear lord these look scrumptious. but as impressive is your styling! those cups and napkins - oh my!!! These are so cute! 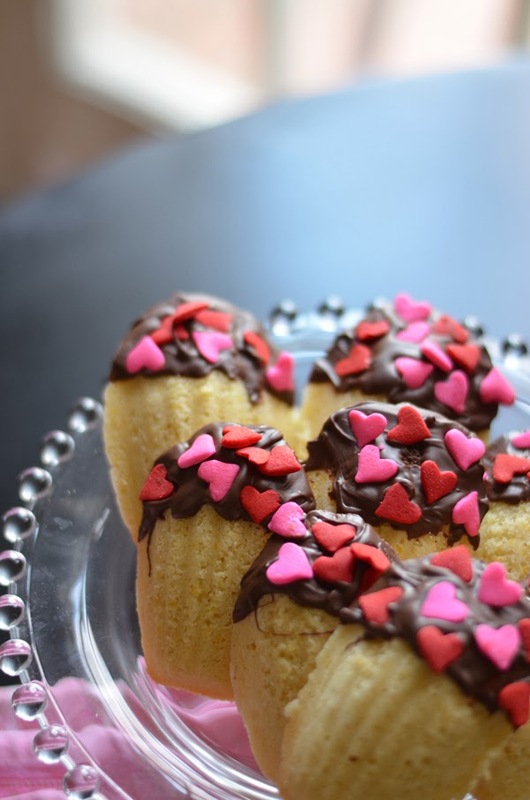 What a great idea, use frosting to add hearts! Love it Albertina! yum the madelines looks delicious AND super cute. 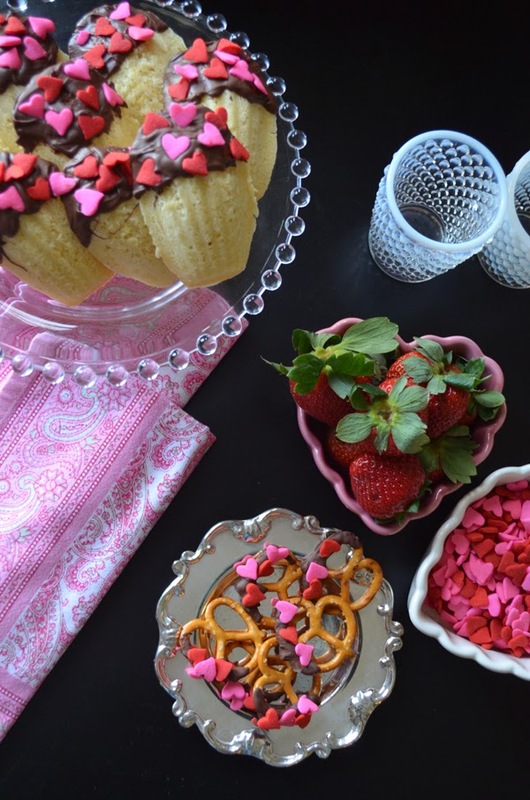 I need to do some valentine's day baking/decorating! What a darling idea! I bet it was lots of fun in the kitchen that day. 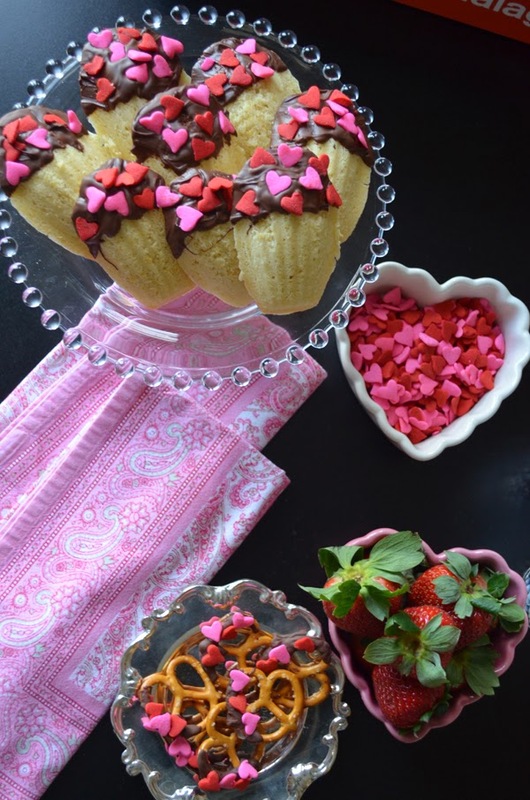 These are the cutest valentines treats and I'm sure they're delish as well!!! 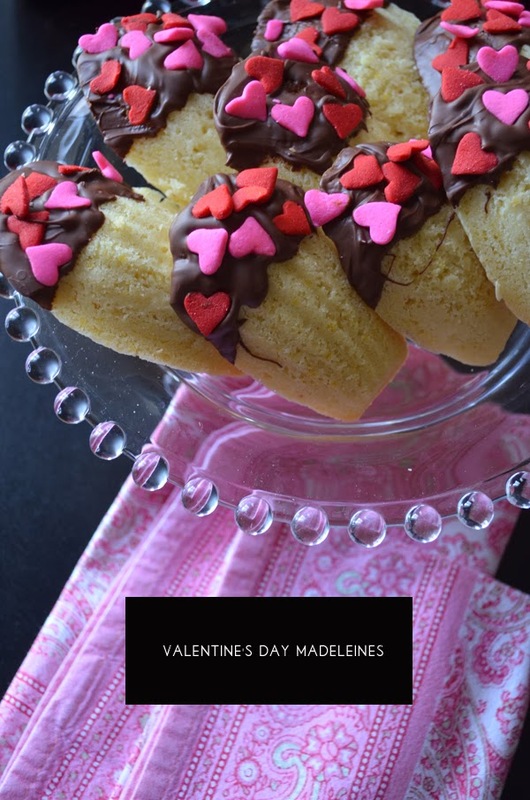 those madeleines are so adorable! Yum! How adorable! I am going to try these with my kids. Such an adorable idea! Definitely need to add these to a few sweet treats this year! Yes. Yes. Those look so sweet. And yummy! How cute are these?! I would probably cheat though, and buy madelines. Yours turned out so perfectly that I thought that's you had done! Oh this looks awesome. I tried making cookie cutter cookie for this first time this holiday season and they turned out really well. I am going make them again. These are so beautiful and yummy! I cannot wait to make them with my girls! Wow! They are gorgeous and look so delicious! I'm sure your little one loved helping you make and eat them!!! Such sweet treats! I bet they tasted even better knowing you had a cute little helper baking with you! these are such cute treats!